After coming to Pune, with my older child starting school, me being pregnant the second time and then my son being too small, we hardly went to any off-beat places. With my son being small, we couldn’t go on too many experiential places and stuck to regular sight-seeing tours or kid-friendly resorts and places. But this year, with both the children at an age where they could appreciate such outings, we decided to try a location that is really close to Pune – Bhigwan. Bhigwan is a small town or rather village that is on the borders of Solapur and Pune. It is nearly 105km from Pune and is located on the backwaters of Ujani Dam. Come January and this place is a paradise for birdwatchers and wildlife photographers. A lot of migratory birds can be seen here. According to Wiki – there are over 230 species of birds found here. At the Bhigwan bird watching point. Car – If you have your own vehicle, it is approximately 3.5 hours away from Pune. The roads are good so the drive is amazing. Bus- You can get on buses going towards Solapur and get down at Bhigwan. There are decent amounts of state and private transport buses available. As the distance isn’t too much, we figured this will be a great experience for our kids, without tiring them out. We set out early in the morning with a packed breakfast and some snacks for contingencies. We reached around 8.30am and went straight to the water front at Kumbhargaon. With the knowledge and information about Bird sighting being popular, a lot of watching points and guides have come up but our research suggested we go with Agnipankh Agrotourism. And that was the best decision that made this trip memorable. Agnipankh is a start-up by Sandeep Nagare and his brother. They have educated and trained local youth as guides in this profession thereby creating jobs and a thriving local eco-system where the village is interested in protecting the birds and their habitat. To go to Agnipankh, there is a small single road. There are farms on both sides with a some houses in between. A quaint village life pops up as you take a left and reach the doorstep of a non-descript house. The house doubles up as office and has option of breakfast and meals. As this is agri-tourism, don’t expect a lot of options. The meals and breakfast are simple, homely and local. You can expect – veg/ chicken or fish thali for lunch and poha/ tea etc. for breakfast. For day visitors, there are arrangements for toilets and snacks. The main focus of the business is to help you see as many birds as possible, so the ride is not bound by time. The only instructions given by them were be quiet and don’t try and feed anything to the birds. The backwaters are calm and when we went a few fishing activities were on-going. The lake was filled with small fishes and we could see them swim alongside our boats. As we reached the other end of the backwaters we were greeted by a host of birds. The guide name the birds in Marathi, English and gives you basic information like why it has that particular name, where has it come from and the usual spotting season etc. If you are a photographer, they help you get good photographs in terms of sharing information about the best time, holding special rides etc. They even have an overnight night trail plan. Frankly, before going there, we only knew about flamingos coming to Bhigwan and we went there looking for them! To our disappointment, there was only one flamingo who had arrived till we went as the season was just starting. But as the guide shared information, we saw and enjoyed spotting so many variety of birds that the disappointment of seeing a single flamingo vanished in no time. We saw many birds, namely Painted Storks, Grey Heron, Riverton, sea gulls, Black stilts, Flamingo, Ruddy shellduck, Asian open bill stork, sand piper, pond heron, igret, black headed ibis, common coot to name a few! As we didn’t know about the overnight ride or the home stay option, we hadn’t come prepared. After our boat ride, the guide showed us some of their videos of night watching and we felt bad that we hadn’t come prepared. We will definitely be going back for the night-watch! But the current trip also left us mesmerized. 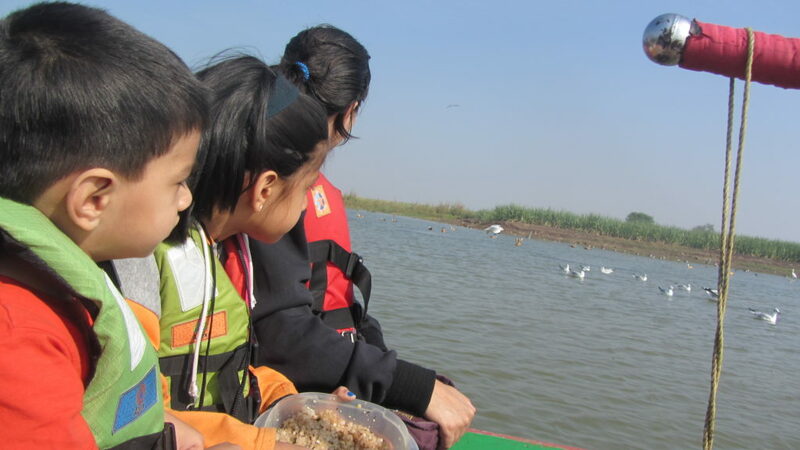 My children learnt a whole lot about the many birds, the boat ride itself was fun and seeing village life up close was another added bonus! If you are near Pune, you should try this location for the sheer amount of diversity that it nurtures. Lovely pics and very refreshing post. Nature is so generous n its hues never fails to mesmerise. Wow, great way to beat the heat. Not an ice cream fan, but loved ur recipe. Wow this looks like an amazing place for bird lovers and photography enthusiasts. I would love to visit! I love these kind of places which connect me the nature. Beautiful pics ! Thanks for making me know about this place. Do read my latest post and share your views. Looking for a bird watching trip.. Surprised to know abput this place in pune.. Hearing the first time. I’m sure this was a great learning experience for the children. They seem so interested. Thanks for sharing, Neha. What time of the year did you go? My father who is an avid bird watcher will love this place.